Man, the Tigers have their hands full in the AL Central. 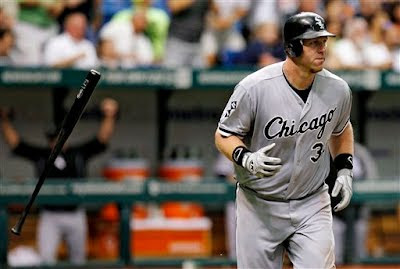 The Chicago White Sox are tearin' it up! On Memorial Day, the White Sox beat the Rays 2-1. Chicago starter Chris Sale went 7 1/3 innings, allowed 3 hits, 1 run, 2 walks and notched 15 Ks! Adam Dunn hit a two-run homer. Remember Dunn's flop-of-a-season last year, when he hit 11 home runs, 42 RBIs and had a .159 batting average - the most unproductive season of his career? Well this year he's already hit 16 dingers and driven in 37 runs. Paul Konerko is hitting .395 with 11 homers and 33 RBIs. Over the past 10 games, Konerko hit .639 with 5 dingers and 14 RBIs! The White Sox have won their last 6 straight and sit 1/2 game behind the Indians in the battle for 1st-place in the AL Central. 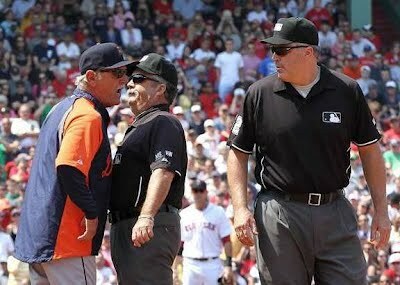 The Red Sox beat the Tigers 7-4 on Monday. Detroit skipper Jim Leyland and third-base coach Gene Lamont were ejected after arguing a blown call by the umpires. Boston had 13 hits, lighting-up Doug Fister for 11 hits in the first 5 innings. Jarrod Saltalamacchia went DEEP for Boston. Delmon Young, Jhonny Peralta and Gerald Laird went YARD for Detroit.